This is a polypropylene or polyvinylchloride (PVC) material. The clear or transparent retainer fits either over the entire arch of teeth or only from canine to canine (clip on retainer) and is produced from a mould after your braces have been removed. You will need to wear your retainers full-time for the first six months, only taking them out for eating and cleaning. 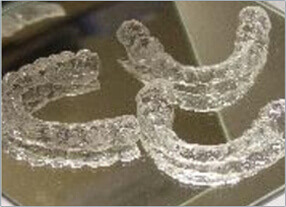 After the first six months, you will be able to reduce the retainer wear to night time. You will need to purchase a retainer case for protection and Retainer Brite tablets for cleaning the retainers four times a week. Essix retainers must be kept in a Retainer Box so as to avoid them getting lost or being damaged. Essix retainers must be cleaned with a clean soft toothbrush without toothpaste and also to use Retainer Brite cleaning solution on a regular a basis. Retainers MUST be checked regularly by the orthodontist. You are reminded to bring your retainer/s to the appointment. Please do call us as soon as possible if the appliance has been lost or damaged.